Social inequalities are established features of the distribution of physical disease in the UK and many other developed countries. In most physical diseases, a clear trend of poorer health is evident with each step down the hierarchy of social position. By contrast, the nature of the links between social position and mental illness in the general population has appeared less clear. This lack of clarity is problematic, as mental disorders are major causes of disability, especially in adults of working age. 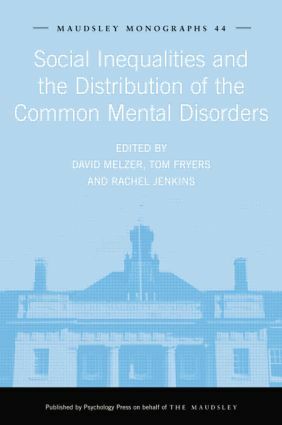 Social Inequalities and the Distribution of the Common Mental Disorders presents in-depth and up-to-date research, looking at the links between social position, ethnicity and mental health. Its findings will have implications for mental health professionals and policy makers.